Ceramic braces? Invisalign? Traditional metal? Golden metal? Self-ligating brackets? Viazis Brackets? What about Lingual braces? These days, there are many choices available to adults, and it gets confusing! Which type of braces should you choose? Can you choose, or is it strictly up to your dentist? These questions come up time and again in our Metal Mouth Message Board. What you, yourself desire. Would you feel embarrassed in metal? Are you only willing to straighten your teeth if Invisalign is used? Do you prefer the look of ceramic or sapphire? Or don't you care, as long as the outcome is good? This section will try to answer some of your basic questions by presenting the pros and cons of each type of braces. Please remember, your final choice is a combination of your preferences and your orthodontist's technical expertise! Ceramic brackets are made of composite materials. They are very strong and generally do not stain. Three popular brands are Clarity and Transcend, made by 3M Unitek; and Mystique, made by GAC. Adults like to choose ceramic because they "blend in" with the teeth and are less noticeable than metal. These are the type of braces actor Tom Cruise had. The ligatures (tiny rubber bands) that hold the arch wire on to the ceramic brackets are often white or clear. This looks great at first, but the ligatures can stain (see the Help! Did I Stain My Braces?). Unless you eat a lot of curry, smoke, or drink a lot of black coffee, this generally isn't a problem. Note that the ligatures are changed each time you get an adjustment -- usually, monthly. It's only the ligatures that stain, not the brackets themselves! They blend in with most teeth, particularly if they are not perfectly white. They are not very noticeable at a distance or in photos. Some people feel that they are more comfortable than metal and irritate your gums less. Contrary to what you may have heard, ceramic brackets do not usually break or come off your teeth. They are very strong, and if bound with a plasma light, stay on as well as metal brackets. The clear or white ligatures (little elastics that hold the arch wire to the brackets) can stain, which defeats esthetics of the ceramic braces. But those are changed at your monthly adjustment. Ceramic brackets are are usually more expensive than traditional metal brackets. Treatment can take a few months longer in ceramic braces. From a purely esthetic point of view, they are a bit larger than metal brackets. If you have severe problems, your orthodontist will not use ceramic brackets in many cases, because they may not be strong enough to withstand the forces of some types of treatment. Invisalign braces are great for people who do not have severe problems. The "braces" consist of strong plastic trays that are fabricated especially for you. They are indeed invisible. If your bite is not severely off and your teeth are not severely crooked, then Invisalign would be a good choice. You would be able to get your teeth straightened without anyone seeing that you are wearing "braces"! This appeals to many adults, especially people who wore traditional braces as children and then need more treatment later in life. However, if your bite is very bad, if you need extractions or require headgear or other appliances, then Invisalign will not work for you; you will need to wear traditional braces. Your orthodontist only has some control over your Invisalign treatment. The treatment trays are computer-fabricated by Align Technologies, the company that makes Invisalign. Orthodontists and dentists that offer Invisalign receive special training from Align Technologies. In my personal opinion, it is best to get Invisalign done by an orthodontist, who has been specially trained in tooth movement. One of our readers wrote a short essay on the pros and cons of Invisalign. To read it, click here. Personally, I have heard that the success rate for Invisalign is only 50%. No doubt, that "failed" 50% had problems beyond Invisalign's capabilities or were treated with Invisalign inappropriately. So, if your orthodontist says that you are not a candidate for Invisalign, you should probably believe it! If he or she says that Invisalign will work for you, then great; go for it! I have known people who have had very successful Invisalign treatment and who have been very happy with the results. Many readers of this website are Invisalign wearers. The official Invisalign website is at http://www.invisalign.com. There are a couple of other companies that do systems similar to Invisalign: OrthoClear and the Red, White, and Blue System also use clear plastic aligner devices. They are virtually invisible, and nobody knows you're wearing them but you. They don't irritate your gums as much as traditional braces, so there is little (if any) need for dental wax. They do not stain at all. The aligners are numbered and worn for two weeks each, so your time in treatment is well established. You'll get a computer simulation showing how your teeth will move during treatment, and see the projected final outcome. They cost as much as traditional braces, and sometimes even more. Treatment can take as long as traditional braces. In some cases, you may still need traditional braces for a few months after your Invisalign treatment, to correct certain problems. You will still have tooth pain, because your teeth will be moved by the Invisalign trays. Invisalign is not a pain-free treatment. The plastic trays are computer-fabricated by Align Technologies. Your orthodontist only has some control over your treatment. It takes 6 weeks for the aligners to arrive from the factory -- a long time to wait. You may need more aligners (i.e., enhancements) after the original set of aligners. If you have severe problems, your orthodontist will tell you that you are not a candidate for Invisalign. Lingual braces are placed behind your teeth, and are therefore virtually invisible to other people. Usually, lingual brackets are made of metal. Orthodontists need special training to be able to treat patients with lingual braces. Therefore, not every orthodontist provides them. To find an orthodontist who provides lingual braces, ask your dentist or search Google for the phrase lingual braces along with the name of your state, country, or location. The obvious benefit of this type of treatment is that no one will know that you are wearing lingual braces unless they look inside your mouth! For more information about lingual braces, visit http://www.lingualcare.com. Other people can't see the brackets unless they look inside your mouth. They tend to be more expensive than traditional metal, because treatment is specialized. Treatment can take a few months longer than traditional braces. Your orthodontist must be specially trained in lingual treatment. Not every orthodontist does lingual treatment. If you have severe problems, or need certain types of appliances, lingual treatment may not be applicable. Metal brackets are very strong and can withstand most types of treatment. At first they may irritate your gums, but after a few weeks, when your cheeks get "toughened up" they are not a problem anymore. Most traditional metal braces require an elastic o-shaped rubber band, called aligature to hold the arch wire onto the bracket. Sometimes orthodontists use metal tie wires (little wires which are twisted around the bracket) in place of elastic ligatures. In the "old days", metal braces were not just brackets, but bands that wrapped around the entire tooth. Nowadays, people wear small metal brackets that are glued to the front of each tooth (a big improvement!) Those old-fashioned bands are usually reserved for molars or teeth with fillings that spill to the outside surface of a tooth. Metal brackets tend to be less expensive than other types of brackets. In addition, you can make them colorful with ligatures that come on a rainbow of colors. 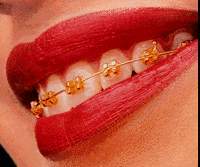 A different type of metal bracket is called the Viazi (or Viazis) bracket, sometimes called "FastBraces." This is a patented technique created by Texas orthodontist Anthony D. Viazis, DDS and used successfully on patients since about 1992. Viazis brackets are triangular and utilize a low-force square wire. The Viazis technique is reported to result in less pain and sensitivity, and complete treatment faster than traditional brackets. The patented braces system moves the crown and the root of the teeth at the same time, from the beginning of treatment, in one stage, with typically one square wire. Conventional braces systems typically move the crown of the tooth with round wires during the first year and the root of the tooth with square or rectangular wires during the second year. For more information on Viazis brackets, and to find orthodontists who use this method, visit the Viazis websites at http://www.fastbraces.com andhttp://www.viazissystem.com. The younger or more adventurous set may be interested in orthodontic metal brackets that come in interesting shapes. Orthodontist Clarke Stevens, DDS, in Nebraska developed brackets shaped like hearts, flowers, footballs, baseballs, and stars. He calls his product WildSmiles Brackets. If you're interested in these brackets, your orthodontist can order them from Dr. Stevens' WildSmiles website, which can be found at http://wildsmiles4you.com/. You may have heard of "speed braces." These are sometimes also referred to as "self-ligating brackets" or "Damon Brackets." Self-ligating means that the brackets do not need the little o-shaped rubber bands (ligatures) or metal tie wires to hold the arch wire onto the bracket. Several companies have come up with various techniques for holding the arch wire in place without ligatures. Damon Brackets, developed by Washington State orthodontist Dwight Damon, DDS, use a 'sliding door' technique, in conjunction with the Damon bracket low force wires. By using self-ligation technology, the brackets allow the wire to slide back and forth. This advancement allows for fewer adjustments and less appointments. These type of bracketsdo not need ligatures (little rubber bands) to hold the arch wire in place. They use a "trap door" to secure the arch wire to the bracket. They are smaller than traditional metal and less food gets trapped around them when you eat. Self-ligating brackets are only used in certain circumstances, so if you are interested in them, ask your orthodontist. The official website for Damon Brackets is http://www.ormco.com/damon/. One of our readers wrote an essay about his experiences with speed braces. To read it, click here. Recently the Ormco company came out with a new type of Damon bracket, Damon 3, which is part ceramic (clear or tooth-colored) and part metal. They are pictured here on the right. These brackets appear smaller on the teeth and are supposed to be more comfortable for the patient. To find an orthodontist who provides Damon braces, ask your dentist or search Google for the phrasedamon braces along with the name of your state, country, or location. 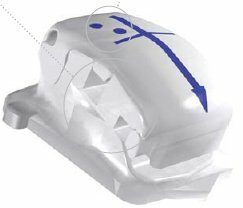 Another new type of self-ligating bracket, called In-Ovation is made by the GAC company. It is a twin bracket made entirely of metal, and utilizes a special clip built-in clip. The pressure from specific types of arch wires activates the clip and delivers specific torque to each tooth, resulting in fast, directed results. The photo on the left shows a side view of a round arch wire in the bracket's slot, and the clip resting on the outside of the arch wire. As you can see, the slot is rectangular and the arch wire is round. However; when a rectangular arch wire is used (later in treatment), the arch wire seats more firmly in the slot and engages more pressure from the clip. For more information about the GAC In-Ovation bracket, visit their website at http://www.gacinovation.com/home.html, which has informative PDF files and multimedia presentations. The main website for the GAC company is:http://www.gacintl.com/products.html. Metal brackets tend to be the least expensive of all the types of braces. The golden brackets are different, novel, and generally look nice. Viazis Brackets and self-ligating brackets can complete treatment in a shorter time with less pain; however orthodontists need special training in these systems, and they not available everywhere. They tend to be a bit less comfortable at first, (but that feeling wears off after a couple of weeks). When you have a canker sore, they tend to irritate your gums more than ceramic brackets.